On the back of City’s 1-0 win over Oldham, Katie Whyatt grills Gareth Walker, Nathan Evans Phil Abbott and Tom Swithinbank on where the playing style leaves the team – and the fans. What did you make of how Chris Routis played and the future of Gary Liddle? Gareth – Routis did okay, but he’s no Gary Liddle. I said to my dad on the way home that it sounded like Phil Parkinson was trying to force Liddle out. He stated that Liddle wants to stay, yet he still opted for Routis ahead of him. Something hasn’t been right for me since Liddle wasn’t picked on the opening day of the season. The guy was one of our best players last season. Maybe with the style of football being heavily criticised at the moment, and some pointing the finger at a lack of runners from midfield, Parkinson thinks that he can rectify that by shipping Liddle out and feeing up wages to bring a more attacking-minded midfielder in. I’m speculating here, but maybe he thinks that he can use Routis and Evans as our deeper lying midfielders. Knott is clearly an attacking option and Routis seems suited to a holding role. Evans is a bit of a hybrid of both for me. However, to let Liddle go would be a risky business in my opinion and it will be interesting to see how things pan out in the remainder of the transfer window and beyond. Nathan – Since Routis came back from injury in that Bury match last Saturday, he’s done really well, especially considering he played at centre back in one of his two games and midfield against Oldham this weekend. I really like versatile players and in Routis we have that, as he can play a number of positions. But I have to say too that for me Gary Liddle is a better option. He had a fantastic season last year and has become one of my favourite City players during his time at the club, because he plays with that sincere passion you want to see. I love how he puts his body on the line for this team. Due to the fact he too can play centre back if needed, I think he’s a key option to have for the team and to be honest, I feel like it would be a bad decision to let him move. Phil – I felt Routis was one of the more industrious and effective players on the pitch. To be fair to him, the few times he has played, he hasn’t been afforded anything like a run of games to establish himself, either in midfield or defence. I think his inclusion in midfield may have been a signal of the level of dissatisfaction at the likes of Liddle and Knott who have been far too inconsistent in recent weeks. Both have way more to offer when on form. I think Routis will get another chance on Tuesday and hope to see him play well, if not just to remind his midfield colleagues that their places are far from assured. What I like about Routis is that he is a box to box midfielder and is deceptively pacey. Having said all of this, my gut feeling is that Liddle is too valuable a commodity in this squad for us to be offloading him at this time and we would have to make a very good signing in replacement to justify it. Tom – I’ve always been a fan of Routis and wasn’t surprised to see him start after the positive words about him in interviews. He isn’t as strong positionally as Liddle but offers a lot more in terms of probing balls forward and energy to move us up the pitch. He showed a few lovely touches. He always wants to get on the ball and make something happen. I know it hasn’t happened very often to City in the past few years, but I don’t find it surprising to see someone not making the squad even if they are fit. City fans seem a little conflicted after this game – the team are winning, but the playing style is causing upset. What do you think of the style this season? Gareth – Let’s not kid ourselves: Parkinson has always been a conservative manager and somewhat of a long ball merchant. This season though the football has been as dull as it’s ever been during his reign. It’s like the Peter Taylor and John Docherty days. I don’t think that losing our wingers to long term injuries has helped at all but our lack of cutting edge in the final third is alarming. I’ve spoken to WOAP Editor Jason McKeown about this at length recently, and I think the conclusion that we drew was that long term fans will put up with it and will take the three points by whatever means possible, but keeping the new members of our 18,000 fan base will prove very difficult if the entertainment levels don’t improve. Having said that, I’ve been going to city for 25 years now and I must admit that this is the first season where I’ve decided that I won’t be traipsing over for all the Tuesday night games after Christmas. 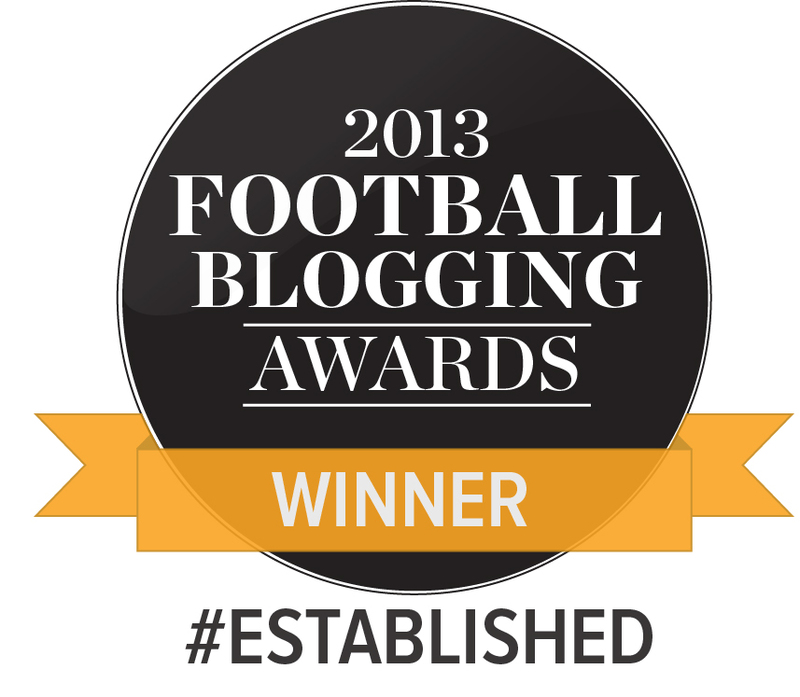 The style of football simply doesn’t make me want to do it – and that’s a first! Nathan – Yes, football is all about the winning, but the way the team is playing at the minute is woeful. I can’t be the only one who sits there finding it a bit embarrassing to be honest when every single ball seems to be pumped up to Hanson whilst the away fans stand there shouting ‘HOOOF’. The one key thing I will say is yes, the winning is what matters, but if we manage to scrape into the play off race and come up against the likes of Coventry, Gillingham, Wigan, Sheffield United at the semi-final stage, it won’t even be worth getting that sixth place spot. If we played like we are at the minute, we’d be beaten quite easily – like in those recent away games at Bramall Lane and the Priestfield. 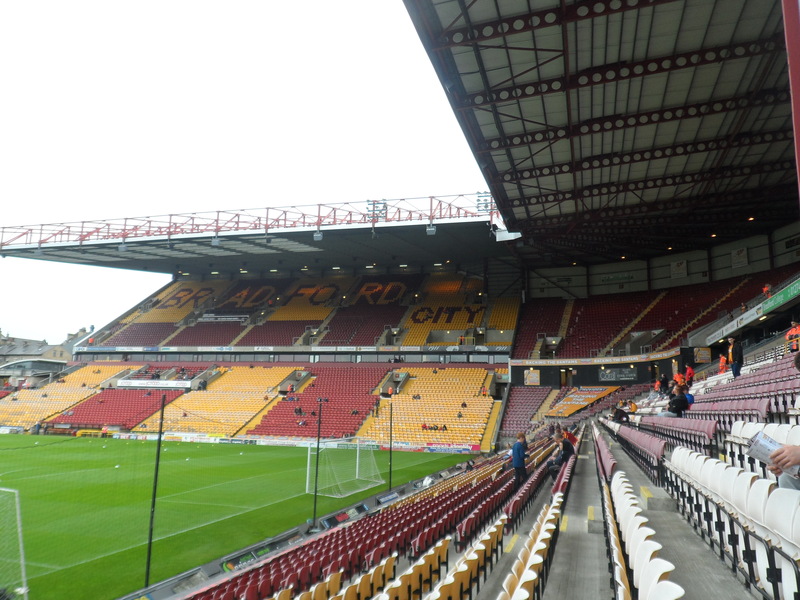 With 18,000 season ticket holders, some of which are attending games for the first time, we need to start playing better, more attractive football at Valley Parade to keep the fans excited, simple as. Gareth – I think you raise a good point about our style of play and the play offs. The problems really start when you’re playing the way we do and not getting results. Where is the cut off? I’d say that different people draw the line in different places. If we were top of the league then the playing style would probably bother far fewer people, but if you’re struggling to scrape into the play offs, is the lack of entertainment a fair trade off? Tom – The football, even with 22 men on the pitch, was much better in my opinion and we were moving the ball around – but chances were still few and far between! It is clear to me that confidence is low, individually and as a team. People seem unsure of what to do with the ball and are taking one second too long to make decisions. That Meredith ‘non throw in’ was an absolute joke! Everyone knows that we’re not the best footballing side and it does put off those fans who are unsure, as Gareth said. Parkinson has tried to improve this with the signings he’s made, but three of those have been injured for most the season so we need to cut him some slack. Perhaps Liddle moving on would see some more skill with the football on show in Morris and Routis, or indeed a new signing. Where do you think the issues lie and what changes would you make? Gareth – The crossing was appalling and the strikers can’t be blamed for that. Having said that, when they have been presented with chances in the recent games at Gillingham and Bury, then they have squandered them. Both of these problems need to be resolved. In the strikers’ defence, they are under a lot of pressure to take the chances that do come along because we don’t create enough of them. It would be too simplistic to say that it is all down to crossing and out of form strikers because the style of play and a lack of runners from midfield doesn’t help, but I can’t see either of those changing under Parkinson’s tenure. Nathan – On the back of that performance, I’d like to see Josh Morris get the nod over Kyel Reid next time out. Reid had a poor performance – his crossing in particular was very poor and at the end of the day, you can’t score goals if the delivery is sailing over the attacker’s heads every time. One of the main problem lies in my mind is the fact that we play backwards because of that lack of running up front. My only thought is that if you try Clarke and Cole and get them running behind the defence, the long ball ‘tactic’ will be used a lot less. Results are results but when I pay for my season ticket I want to be entertained and it’s just not happening at all at this moment in time. Phil – The game wasn’t disastrous, but it had a distinct feeling of mid-table VS relegation battler. We wanted more than that for our team this season. I suspect Marshall will be given good game time on Tuesday and if his cameo was anything to go by. His service into the box will be much better than the disappointing results of Reidy’s work on Saturday. Tom – Reid’s crossing has always been his weakness (if it was decent he would never have played for us in League Two) and I would argue that he looks a bit clueless at times – when Meredith has it he moves towards him to receive it, if the pass isn’t on then his movement is poor, often non-existent. I’d like to see Marshall given a go, in both the last two games he has beaten his man and delivered crosses, with both feet, hopefully he can carry this on to a starting role. Morris looks like a player that needs a goal or at least an assist to boost his confidence. Would a midfield of Marshall-Routis-Evans-Morris be too attacking? 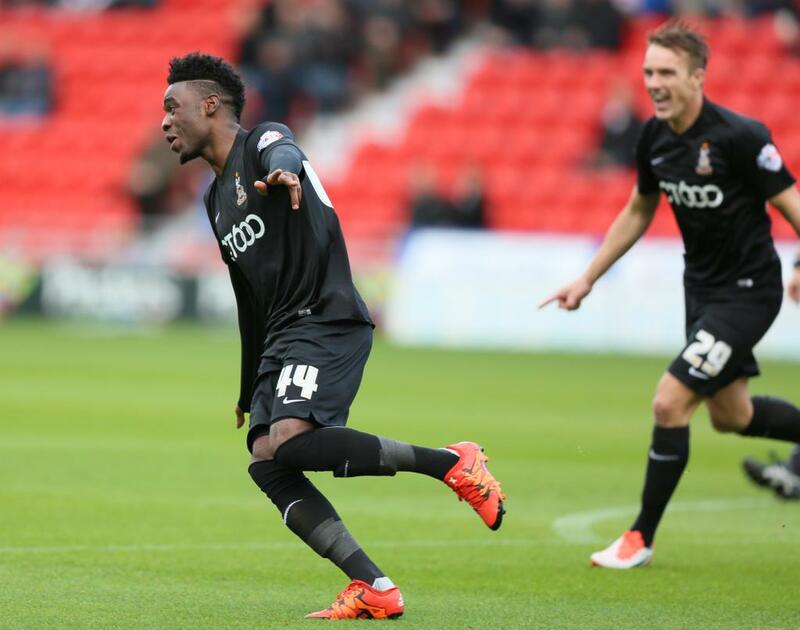 Devante Cole has come in for heavy criticism of late – how do you think he did? Gareth: Devante should be in the team for me. Billy Clarke is badly out of form and I’ve always said that he doesn’t suit a 4-4-2 anyway. Cole is arrogant and lazy at times but what goalscorer isn’t? He still looks like our most likely source of a goal and he should have been on the field earlier in order to stretch the ten men with his pace. Nathan – Along with a lot of the other fans, I’m still really undecided on Devante Cole. Our team over the last two or three seasons in my opinion has had this fantastic work ethic where every single player has put in 100% and has been able to come off the pitch at the end of the match and say they’ve given it their all. However I just don’t see that with Cole. If you compare him with Wells or even Clarke and Luke James, Cole doesn’t want to do the running or do the dirty work that has to be done sometimes. I agree that Billy Clarke is massively off form at the minute, but for me he’s our most technically gifted player when he’s on form. He just needs that lucky break to start performing again. Phil – I wonder if Parkinson is going to tinker with the front two for the Bury game. It’s not that I don’t like Hanson, but I feel he needs a break and the City team need a new dimension up front until he hits his form of old. I remain unconvinced that Cole is the long term answer to our goal drought. Tom – Poor Hanson can’t buy a goal – a great block on Saturday, unlucky on the slide at Bury… He really needs one soon. As for Clarke he’s struggling too. His first touch is poor and it’s not falling for him, although it must be said that it hurts the players when they don’t perform – Clarke letting out a scream of frustration after a miss-kick on Saturday a case in point. Cole wants to be involved in the build up, and I’d love to see him turning and running at players but it was clear he was closer to Hanson on Saturday and going for those flick ons. He seemed to be working harder but (admittedly he’s a lot fitter than me and has longer legs, so maybe just makes it look easy) he never seems to be running at 100%. I don’t think Saturday was bad at all. A number of time we worked the ball well down the right hand side or middle and switched the ball to Reid who – to be fair – had got himself in a good position only to be very wasteful with what was developing into a good opportunity. I’ve always said the same of Reid and his crossing isn’t good enough even for an L1/2 winger. He is called our ‘attacking winger’ but how many assists/goals has he got this season? With regards to Liddle – I will be very disappointed to see him go but I see the reasoning. He has been replaced by Evans who is now our defensive midfielder and is a better option than Liddle. Perhaps Parkinson thinks he can get Evans – who is also younger and potential sell on value – past the end of this season? So Liddle who came from being Notts County captain and PoY won’t be on an insignificant salary may free up some budget to strengthen where we are weaker. With Routis, Knott and Morris all available to compete for that place alongside Evans it makes more sense. Finally, I do laugh at our fans who seem to want this on the floor exciting football but every time it does go backwards or even sideways there are screams of ‘get it forward’ – you can’t have it both ways! Look at how Coventry played against us the majority of their possession was among their back 4 waiting for the opportunity to play that way you have to have patience which a lot of our fans have shown they are incapable of by demanding that we should be a Championship ready side. Why can’t you have entertaining football whilst still getting the ball forward? In my book the most entertaining teams I watch are Arsenal and Barcelona who play most of their football on the ground but still get the ball forward thereby creating chances and scoring goals. It seems to work for them as they sit atop the premier and Spanish leagues. Although I wouldn’t for one minute compare our beloved City with those two teams the principle remains the same. I think a better example of the sort of style we should be adopting is Bayern Munich – or even Leicester. For me the tikka takka sytle of Barcelona only works if you have the players of the quality of Messi et al to unlock the door and make the procession count. Otherwise its a very dull watch. Bayern’s power and pace show that a direct style need not mean hoofball and City, at their best over the last few seasons, are capable of showing these qualities. Similarly Leicester’s success this season hasn’t been predicated on procession but on a fast counter attacking style. I just think that if confidence is low and players aren’t at their best the direct style can quickly regress to hoofball, especially at home where teams are likely to sit back a little. The fact is that if the opportunity doesn’t present itself what do you do? Just give the ball back to the opposition. No you start again and build again that is my point. I completely agree with the comment above we don’t have the players to play quick 1 touch tika-taka as some of our players struggle to play a still ball 10 yards to the their team mate we just don’t have the quality because you need 11 excellent footballers to do this. McCardle as good a defender as he is doesn’t have the quality to play that way, Reid for all his pace doesn’t have the quality to play that way, and I don’t think any of Hanson, Clarke or Cole could play in such a way they aren’t suited to it. Reid was terrible on Saturday but to be fair to him, he never hides away and always wants the ball. He’s also the only one in the side who (on his day) can go past a man which is where we lack when we attack. I don’t think we are a million miles off being a decent side it’s just frustrating seeing these negative and defensive minded tactics being deployed every game. Why doesn’t Derby overlap the winger anymore? Why can’t Evans play further up the pitch when we’re attacking? Why do we only have Hanson in the box when/if a cross comes in? We also never, ever play through balls on for Cole (or whoever) to run onto, or fire a ball over the top for them to do the same. We are too one dimensional and easy to defend against. As for Liddle, he’d be the first name on the team sheet for me and think it would be foolish for us to get rid of him, he’s versatile, has energy and commitment and worked well with Evans/Knott. Seems a strange one to me. I feel that the result was the main thing, it was the type of game where we have let points slip in the recent past. Perhaps worth remembering that our previous home league game was in late November against Coventry – good game & excellent advert for Lg 1 – few (if any complaints). But now many want to jump on the style of play thing (as with LVG and Man Utd). On Liddle yes I’d have him in, and Cole as well to give us pace that we lack plus finishing instinct. However I’m happy to leave it to PP. Gareth: ‘it’s like the Peter Taylor and John Docherty days’? Wash your mouth (and possibly your eyes) out with soap and water. Yes, this team isn’t often exciting to watch but it is nowhere near as bad as those dark ages. It’s all subjective of course but IMO the football played on Saturday was akin to what we saw during the reigns of those two managers. After 24 games this season we have scored 25 goals. After 24 games of the 1990-91 season (Dochertys only full season in charge), we had scored 29 goals. After 24 games of the 2010-11 season (the one which Peter Taylor was manager for the majority of), we had scored 22 goals. Goals scored might not be the best way to measure the quality of football but it’s goals that get us off our seats the most I suppose. Admittedly Saturday probably was one of the most dour games of the season but it’s only my opinion at the end of the day. Liddle going would be a huge loss, he’s one of our best players I think – intelligent, good positioning, uses the ball well, and just about the only player who will actually ‘put his foot in’ to win back possession rather than ‘shepherding’ the ball. I find it hard to fathom Routis being played in front of him in either the midfield or central defense positions.